Some time before TAM London I was recommended by someone on a blog (I think it was one of the Skepchicks) to read The Men Who Stare At Goats by Jon Ronson, because it was a good book that was being made into a film — and Ronson was likely to talk about it at TAM. Almost as an aside, this same blogger also recommended Them: Adventures With Extremists by the same author. I found both books cheaply at Amazon UK so I ordered them (I mean, I ordered Them, and I ordered The Men Who... oh, forget it). When the books arrived I perused the blurbs, and noticed that Them had a reference to David Icke, and when I flicked through it I saw there was a chapter titled "There are lizards, and there are lizards". So I turned to it. Soon I'd read the whole chapter, and decided to start the book at the beginning, immediately. It was that compulsive. 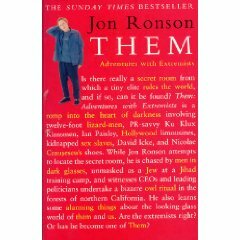 Ronson spent time with a variety of extremists, conspiracy theorists and nutters (er... Icke? ), reporting his conversations without foisting his own judgement on the reader. He has a self-effacing style of journalism — a kind of equal-opportunity indifference that treats a conversation with a little known Islamic fundamentalist on the same level as, say, Denis Healey. The theme of the book is the search for the secret room in which the New World Order controls the whole world. The fact that some of the conspiracy theorists believe that the members of the elite "Bilderberg Group" (whether or not that elusive group is actually the NWO) consist of alien shape-shifting lizards twelve feet high only adds extra weirdness to the whole affair. It's an amusing journey which reads as if extracted verbatim from Ronson's journal. 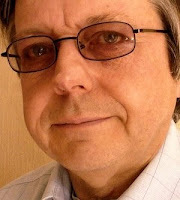 He draws few conclusions, presenting his findings as they are, so the total effect seems more than a little disjointed. It's not a definitively researched thesis, though the dry humour sprinkled throughout the narrative more than makes up for any perceived lack of academic rigour. Ronson seems less concerned with assembling known facts than with conveying the general paranoia of his interviewees. It's hard to judge the extent or significance of what he's reporting, but it does make for a fascinating — if picaresque — story, especially, I imagine, if you have a penchant for sacrificing children to giant owls.